mass operations (process all files in the playlist). The script is configurable via Amarok Script Manager. You can select menu items and features that you need, setup editor and storage directory for lyrics. All these parameters are saved in a config file and loaded silently at player startup. Lyrics Manager takes care of HTML tags and special symbols in lyrics and lets you edit a plain text. If you enable editing features, you should configure editor. It can be any shell command with arguments, filename is inserted by script at the end. Editor must work in foreground mode. %% for a single percent symbol. Any other % with a following symbol will be removed. Default template is "%a - %t.txt". Also you can save lyrics in the same dir where the audio file is. Use "Place text with music" option for that. "Automatic export after edit" feature helps you to keep texts directory up-to-date. Files with an empty lyrics, i.e. lyrics that contain only space characters, are handled specially. You can choose whether to export and import empty lyrics or not. 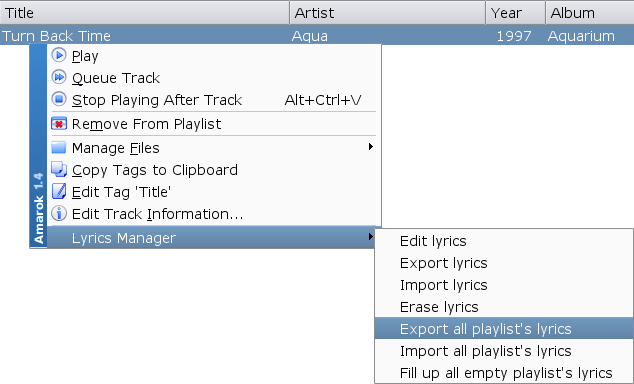 If you want to remove lyrics from Amarok database for particular file, use "erase" action. Player will automatically download lyrics when you play a file that has no lyrics entry in database. To prevent fetching you can use "fill up" action that will create that entry and put an empty string in it. This action applies only on empty lyrics, other cases are ignored. Mass operations will save your time. They are also could be used to backup and restore lyrics. All items of playlist are handled sequentially and report is generated at the end. 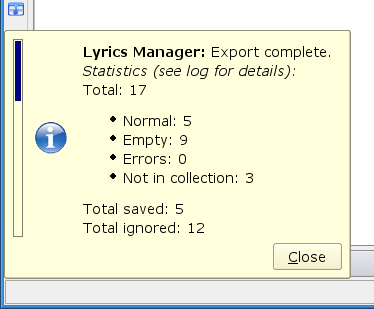 Note that lyrics are stored by player only for those files that are in its collection. Script determines this status for each file and skips ones that are not in the collection. Tested on: amarok 1.4.10; perl 5.8.8; kdebase 3.5.10. 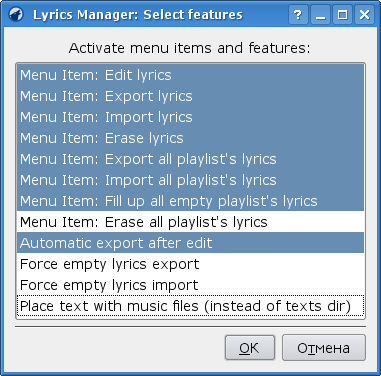 Current version: Plugin Lyrics Manager 0.2.14. Download archive and install the script using Amarok Script Manager. If you do not have KDialog installed (it comes with kdebase package) then configure the script manually using instructions in the next section. The script could miss some special characters in lyrics if your locale is not Unicode. This seems to be DCOP restriction and there is nothing we can do. You can ask questions and suggest ideas in the corresponding topic of the blog or by sending emails directly. There is also the project page on KDE-Apps.org, but only registered users are allowed to comment there. Thanks to panzi (KDE-Apps.org), bleearg (KDE-Apps.org), BrutuZ (KDE-Apps.org), Max (xzoert.org), Vincent Ramos and others who suggested ideas and helped to test the script.